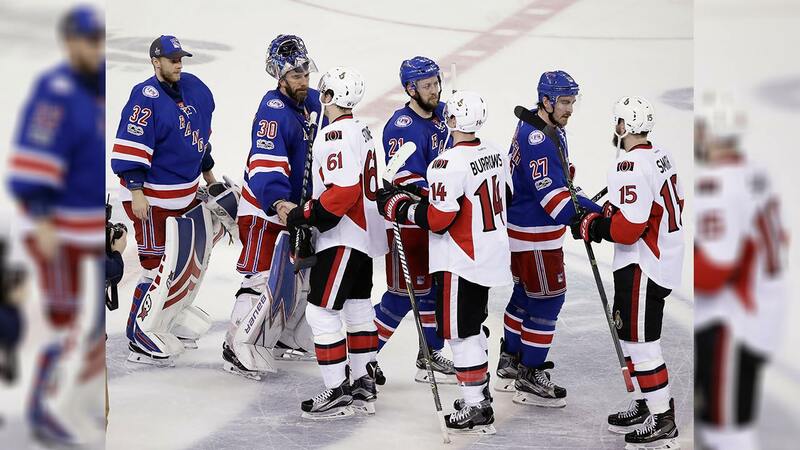 NEW YORK (WABC) -- The New York Rangers are coming off a disappointing second round exit in the 2017 Eastern Conference Semifinals, having lost to the Ottawa Senators in six games. Turning the page, they are poised to make another run. But the window is closing, as their world class goaltender Henrik Lundqvist turns 36 years old later this year. The Rangers brass showed their commitment by signing the best free agent on the market in Kevin Shattenkirk. A local kid from New Rochelle, NY, he will bring his defensive prowess to Broadway, and add stability. Combine that with Captain Ryan McDonagh, Brendan Smith, and the young and upcoming Brady Skjei, their defense looks to be very strong. That wasn't the only move in the offseason. The Rangers traded longtime fan favorite Derek Stepan, and back-up netminder Antti Raanta to Arizona. By doing this, they grabbed the seventh pick in this past June's draft and added defenseman Anthony DeAngelo. That first round pick turned into Lias Anderson, a very reliable two-way player from Sweden. He could potentially earn a starting role with a good showing in this year's training camp. The only thing left for the Rangers to do, would be to make a trade for a top line center. Rumors have swirled in recent weeks, but it's also possible that the Rangers won't address this until the trade deadline. The crop of eligible talent may be greater, but by waiting until then the Rangers may not be in a position to make a trade.